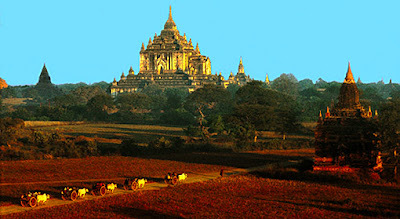 Bagan in Myanmar or Burma is in a remote corner of the world hidden beyond India and placed around the mighty Irrawaddy (Ayeyarwady) River. This ancient town has many kings and rulers seen passing only one parameter was constant Lord Buddha and the Irrawaddy River. With mystic Buddhism and incredible monuments an ancient place where people lived for around 1800 yeas in an urban environment the city is probably older but there are no visible tracks anymore. Transportation is easy, either via air from Yangon and Mandalay which is around one hour or by road (not a good idea because roads are very bad) in 7 hours. Weather is fine and sunny except during monsoon times from around June to November. Climate is tropical means hot all the time as it is in Central Myanmar wear very light cloth only, otherwise, if you visit the icy mountains of the north there is ice and snow throughout the year. Visiting central Myanmar means not only pagodas and temples there is more for sure. Although this is the driest part of the country with all the negative effects there are plenty of attraction. Here are a few of the major day trips in Bagan And again use a guide, the local people are quite poor and you as a tourist can bring them a respectable means to earn money that's their job so everyone will earn some money from the foreigners. Keep in mind they don't have any other source of income. When you hire any of them ask to show some paper or ID from the state MTT to make sure that you get a qualified person and not one of this guys who don't know anything and only will beg you for money. Bagan websites and books are a nice reference but the only ones who let you discover what you expect on a day tour are the qualified professionals and as indicated elsewhere they have the key available to open the door on many temples and pagodas in Bagan. Keep in mind that most of the brick structures are ruins only they also would make sure that the bricks fall on your head and more. Some places offer acrobatic shows and puppet theater. Maybe just climb up the Shwenandaw Pagoda in the late afternoon and watch the sunset behind the Irrawaddy. But do it early since you wont be alone. A Irrawaddy Cruise either with a sail boat or a bigger one with an engine is one of the best turns around. The most interesting is to move along the banks in a distance and watch the people. Their live is dominated by the stream with lots of surprises and colors, give it a try. A short trip to Mount Popa, during that drive you can get a good insight into the countryside and the real spiritual life of the local people. Because although Buddhism is the official religion in the country since at least more than 1000 years the believe in the ghost and spirit system is just as strong as it was thousand years ago. Interestingly it is identical in Thailand, no difference including the spirit houses in front of every building, read more. This is a detour into the past and gives an idea what happen in the country before Buddhism, when the Nat Spirits where the ghosts the people prayed to. About Myanmar Buddhism, this is a very conservative version since they even wont allow women to get ordinate similar to monks. Considering that thishappen in the 21th Century it's a bit strange, read more. Pagodas Buddhist Shrine Temples & Stupas. Pagodas Buddhist Shrine Temples & Stupas the sacred monuments are probably the most important showcases of the country. Temples and pagodas serve the same purpose but in terms of architecture are significantly different. A temple is an open structure somehow like a church or mosque where you can walk in. The pagoda is is a solid and closed building, no way to walk in, see the travel pictures to understand the architecture. 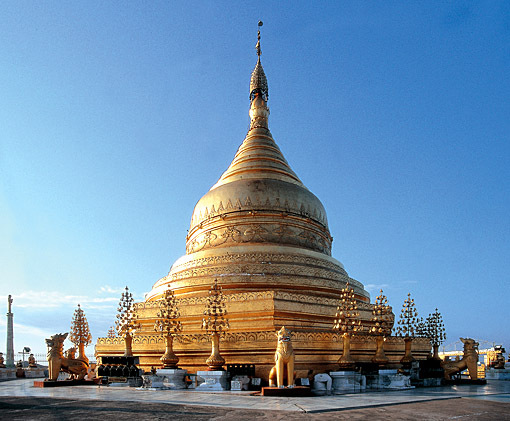 A Bagan Day Tour to Mount Popa. The place is a extinct volcano popping out from the flat plains of central Myanmar with a Buddhist monastery on top. When you see it you might question yourself how did they get the building material up there without a helicopter. After arriving at the foot of mount popa it needs to make a decision if you are fit enough to climb up the steep staircases which are fixed to the cliff. That can be a real challenge, see the pictures to give you an idea but the panorama view from the monastery pays for it, read more. Also when you arrive take away anything which could be taken easily from your body including glasses since plenty of monkeys run around and they are real fast. Once they grabbed something it's gone you probably won't get it back. Day Tour to Mount Popa. Day Tour to Sale Monastery. A tour to the Sale Monastery, this is one of the most popular because it's not to far (about 40 km) and the road is also not so bad. What you get in return? A great insight into one of the most interesting Buddhist teak construction in Central Myanmar. When you are around give it a try, it's worth it.